Idlewild is a cocktail bar tucked in a quiet corner of InterContinental Singapore that celebrates the golden age of air travel through its tipples. Yet another fancy hotel cocktail bar in Singapore, you mutter under your breath. I hear you – ever since Singapore started getting noticed on the international stage for its burgeoning cocktail scene there are more bar openings here – especially in hotels – than available work visas to help staff them all. With the success of Manhattan Bar in Regent Singapore, we increasingly find hotels upping their bar game – Mandarin Oriental finally adds its MO Bar concept to its Singapore property, Amara Singapore lures award-winning Jigger & Pony to set up on its premises, and even Orchard Hotel has revamped its previously ubiquitous Bar Intermezzo space to put itself on the cocktail map. But Idlewild in InterContinental Singapore is that worthy addition to the scene. This classy, modern space is hidden in plain sight; Idlewild is not positioned as a speakeasy, and yet is easy to walk by without even realising its presence. 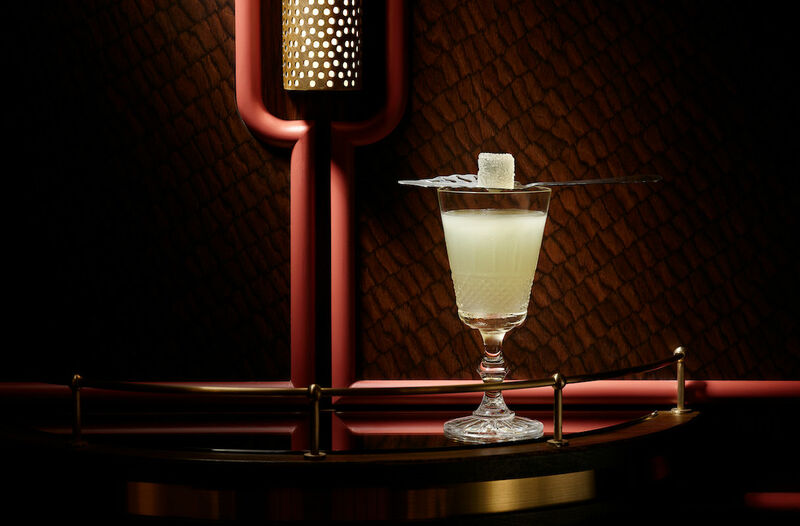 Helmed by renowned mixologist and New Zealand native Andy Griffiths – who moved from Australia’s The Speakeasy Group to join Idlewild – the drinks menu here is a cocktail tribute to the golden age of air travel. Idlewild was the original name of John F. Kennedy International Airport in New York during the 50s and early 60s, a time where jetsetters travelled to exotic places in search of adventure. In line with the theme, Idlewild the bar even has a room of curiosities, a collection of vintage trinkets and old bottles of liqueurs, some of which you can even ask to open and taste (for a fee, of course). Cocktails here too explores (what would have been previously) unlikely provenances and flavours found along the trans-Atlantic route. You’re looking at 10 different cities, each of which has inspired two cocktails, for a total of 20 concoctions in an epic drinking journey. The French Cook – which hails from its Paris section, but of course – is a fancy take on the French 75 that’s made ever the more complex with a dash of absinthe. For a taste of Mexico, the Sugarloaf combines rum and cognac with house-made spiced tepache for a tangy yet spirit-forward tall drink. Then there’s Passage to Havana (from Cuba, obviously), essentially a rum-based Old Fashioned that puts together a Cuban rum blend, Amontillado and PX sherries, Foro Amaro, a tobacco tincture and coffee Angostura bitters for that perfect sipping drink. But for that perfect ending to the night, you can’t go wrong with Dublin’s Caife. We reckon it’s possibly the best version of the Irish Coffee in town. Made with Green Spot Irish whiskey, cold drip coffee, a reduction of Guinness and cider concentrate and then topped with spiced cream, it’s like the best of Ireland in a glass. As for bites, the bar grub here brings you on a similar gastronomic journey. The Hazelnut and Cheese Tortellini would do some Italian kitchen matriarchs proud, while the finger Cubano sandwiches are the best kind of salty, meaty accompaniment to your drinks. And if you’re ordering Passage to Havana, be sure you accompany it with the cremeux-filled profiterole that is the Le Mexique Choux for a total chocolate explosion. For a hotel bar, Idlewild is comfortable and not pretentious; its service efficient, yet unobtrusive. We like that the travel theme is limited to its cocktail menu, and not vulgarly splashed across decor or anywhere else. And if you’re lucky enough to catch London-born singer songwriter Janine Annice accompanied by a four-piece house band perform live here, Idlewild is the perfect place for that perfect romantic date.